In context: Google Doodles are temporary "altercations" to the Google logo on the company's homepage used to commemorate holidays, achievements, events and people. The first Doodle was published on August 30, 1998, and honored the Burning Man festival. Thanksgiving is the default holiday when discussing amazing food but during the summer, Independence Day is tough to beat. Between the annual Nathan’s Hot Dog Eating Contest, backyard cookouts with friends and family and dazzling fireworks displays, there’s a lot to love about early July. 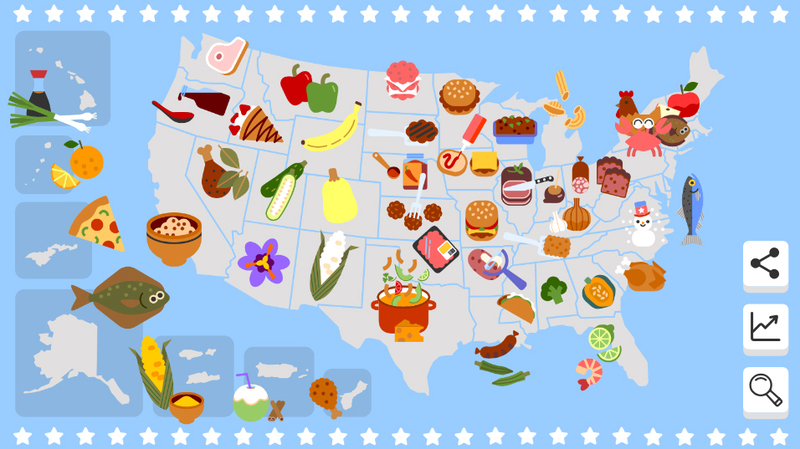 Google is getting in the spirit a day early with its latest Doodle, an interactive “Foodle” map featuring highly searched recipes over the last 12 months from each of the 50 states and five territories. Simply click the corresponding state or territory to view its recipe, sourced directly from Google Trends. Once you get your fill of regional dishes, you can check out other July 4th-specific search trends or revisit some of Google’s earlier Independence Day Doodles.